1) Most women love jewelry and keep buying it through their lives until they have a solid collection that is hidden somewhere in the house! Speaking for myself, I'd love to receive a jewelry holder to get my jewelry situation finally sorted! ~Jewelry Hanger - Etsy | 2) White Adidas sneakers might be more classy than a heel! Such an amazing shoe that matches every outfit and allows comfort! Yas, please! ~Adidas Stan Smith Sneaker - Urban Outfitters | 3) Throw pillows for the living room or even bed pillows? A popular decoration to make every room cozy is definitely a girl's thing! ~Good Vibes Pillow - Urban Outfitters | 4) This kitty mug will make any woman smile first thing in the morning! ~Cat mug - Urban outfitters | 5) Is there anything better than fashionable Minnie ears? Headphones with ears! OMG! These are so dope that I can't even handle! Holy chic! 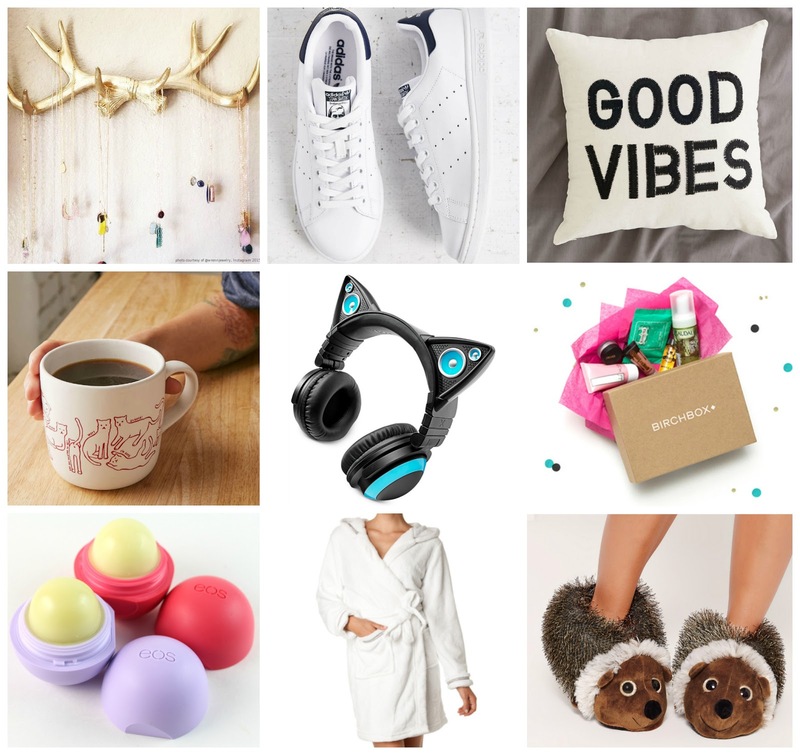 ~Headphones with ears - Macys | 6) If the girl you're getting a gift for loves cosmetics as much as I do, I guarantee you that she will also LOVE getting 5 luxe beauty products in the mail every month! ~Monthly beauty box subscription - Birchbox | 7) EOS lip balms are everywhere and there is a good reason for it! How could you resist all the delicious flavors they offer? Like, if I just got a pack of all the yummy smells under the Christmas tree, I wouldn't be mad at all! ~EOS balms - Target | 8) Bath robe is one of the things that none of us wants to spend money on, but dreams about! There's not a better feeling than getting out of the shower and throwing this soft piece of clothing on! ~Soft Bath Robe - Calvin Klein | 9) All I want for Christmas is to put these comfy super kawaii slippers on my feet and never ever take them off! Are you with me? ~Hedgehog Slippers - Missguided. 1) Everyone loves a nice hoodie! A good and timeless staple in every guy's wardrobe! Can't go wrong with a neutral color like grey, black or navy blue! 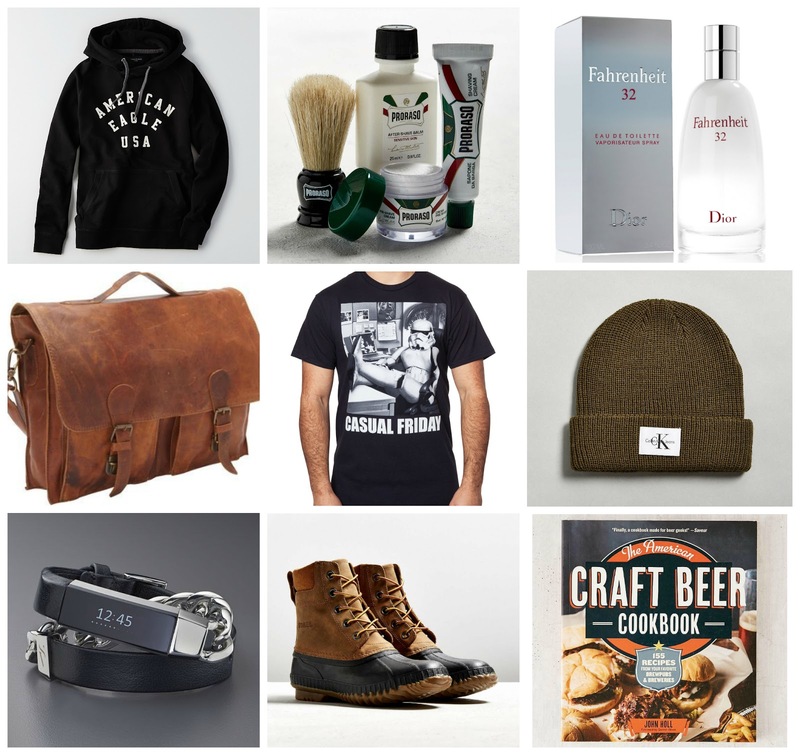 ~Hooded sweatshirt - American Eagle | 2) This classic shaving kit will make any man feel special! ~Shaving kit - Urban Outfitters | 3) This is one of my most favorite men's fragrance EVER! Go smell it and then you will want your guy to use this and nothing else forever! ~Dior Fahrenheit - Macy's | 4) Doesn't matter if he carries laptop to work every day, or other stuff, this high quality bag will serve him for years and will become a much appreciated addition to your partner's style! ~Leather Messenger Bag - eBags | 5) Is he a goofball? This Star Wars T-shirt will make him and all his friends laugh! ~Star Wars Tee - 80Tees | 6) A good beanie is a winter must-have! Doesn't he have one yet? Pick the most fashionable one! ~Beanie - Calvin Klein | 7) Is your guy into sports? Does he like running? Fitbit will keep him motivated! And if he already has it, you can get him an elegant bracelet for Fitbit as well! ~Metal bracelet for Fitbit - Kohl's | 8) For any otdoor lover, the right shoes are essential! Get him a good pair of waterproof boots to support your next adventure together! ~Waterproof Boots - Sorel | 9) Every guy loves a good beer, right? And good food! This cookbook is filled with the most delicious recipes to try! ~Craft Beer Cookbook - Urban Outfitters. 1) Oh what fun it is to give such a hilarious gift! If she's a big tea fan, this is a must buy! 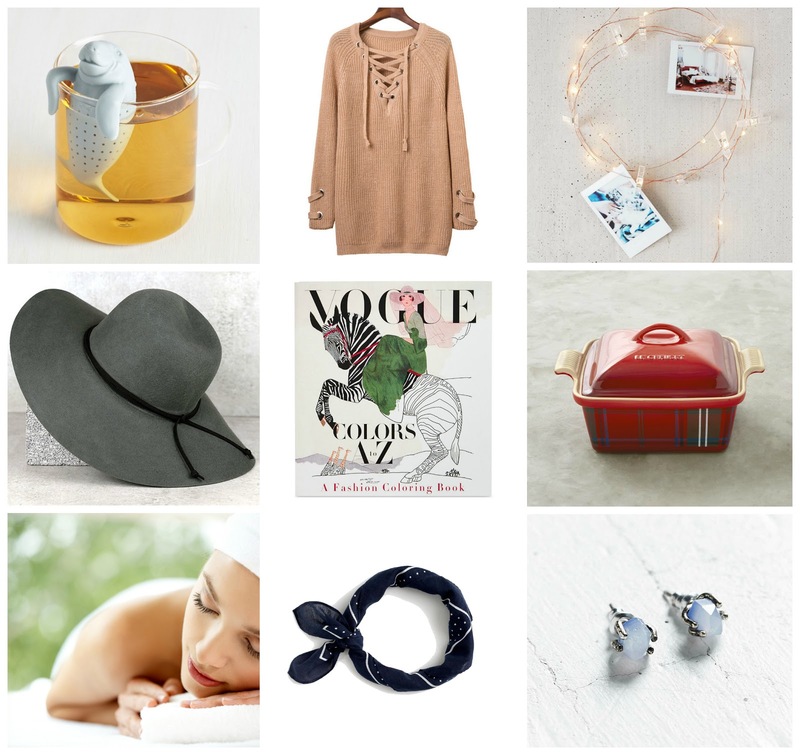 ~Silicone Manatea infuser - Modcloth | 2) I bought this sweater in a cream color for myself and my mom asked me over the Skype to get it for her! She doesn's know I already did, as one of her Christmas gifts! Yay! ~Lace up sweater - NewChic | 3) A great way to both light up the space and keep the memories alive! With those cute lights, you can clip your favorite pictures anywhere you want and see them in the dark! ~String lights - Urban Outfitters | 4) Any chic mom will love a cute hat! Go for a good quality one that will last a few seasons! ~Grey hat - Lulus | 5) Is your mom a workoholic and you want her to chill a little more sometimes? Give her the best gift that helps to relieve her stress! She will forget about all problems while coloring the most adorable pictures! (Don't forget to include crayons in the box!) ~Vogue coloring book for adults - Macy's | 6) Your mom most likely loves cooking for you and the rest of your family! This little helper will make her love it even more, promised! ~Tartan covered baker - Williams&Sonoma | 7) Another great gift for her is a massage voucher! 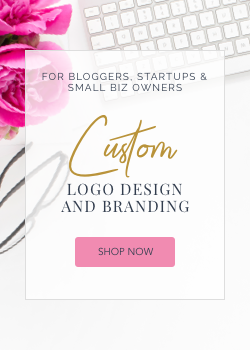 Let a professional take care of her hurting back! She will love you for that! ~Find a local massage place! | 8) Show your mom how to wear a bandana this season! It will look amazing tied on her neck as a scarf, wrist as a bracelet or as a classic hair accessory! ~Polka-dot bandana - J Crew | 9) She is a gem and this genuine pair of stone earrings will speak for itself! ~Stud Earrings - Urban Outfitters. 1) Guys love to keep themselves clean too! (Okay, well at least some ;)) This beautiful grooming set in gold (stainless steel) makes me want to use it right now myself! ~Manicure set - R&B Jewelry | 2) Any outdoor guy and fisherman will appreciate a good pair of camouflage sunglasses! My dad is getting those this year! ~Camo sunnies - Sharpangler | 3) If your dad doesn't like big wallets and usually keeps his cards in his pocket, this will definitely make his life easier and cards more protected! 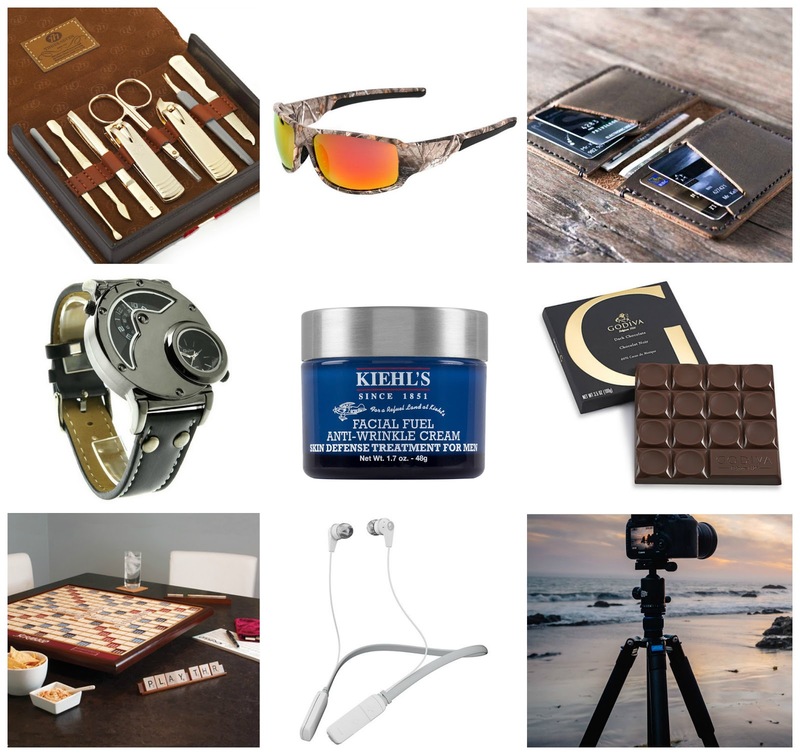 ~Credit card holder - Gifts For Men | 4) A cool watch doesn't have to cost a fortune! This aviator-like looking one is just $10.49! Whattt!? ~Men's watch - Amazon | 5) Keep your dad's skin healthy, soft and wrinkleless! Kiehl's is proven cosmetics that women and also men love all around the world! ~Facial Fuel Anti-Wrinkle cream - Kiehl's | 6) Dark chocolate is a great alternative for dads who are on a diet like mine right now! Get a 70% + cocoa one and avoid all the junk out there! ~Dark chocolate bar - Godiva | 7) If your papa loves board games, make sure to check this one out! A giant deluxe wooden scrabble is most likely his dream! ~Scrabble board game - Improvements | 8) One step closer to the future! Wireless headphones are SO great for someone who is over dealing with cables! ~Schoolcandy Ink'd Bluetooth Earbuds | 9) Does he love photography? He will be excited to open a new tripod! ~Tripod - Davis&Sanford. 1) Backpacks are cool and you can find so many different styles for a different cost! I own a Botkier backpack that you've probably seen all over my blog and that is, my friends, the backpack of my life! Much recommended! ~Leather backpack - Botkier | 2) Polaroids are still in style! If your friend loves fun pictures, you know what to go for now! (Don't forget to get some extra film to it) ~Fujifilm Instax Mini 8 - Urban Outfitters | 3) A cute gold plated necklace with your friend's initials is such a nice and special gift! ~Initial pendant necklace - Kate Spade | 4) Wool Hats with (preferably faux fur) pom poms are a big thing this winter! Even I am eyeing one right now! Keep your beloved friend warm this season! ~Beanie hat - Asos | 5) Make-up junkies know how amazing Anastasia Beverly Hills products are and will so appreciate this amazing and exclusive glow kit! ~Sweets Kit - Only at Macy's | 6) Does your friend get stressed out easily and probably needs a daily reminder to stay sane? This cinema box message will fix anything, anytime! ~Led light No Bad Days - Urban Outfitters | 7) I so wanted this floating pretzel last summer and never managed to get it! This might actually be on my Santa list this year as well! So fun! 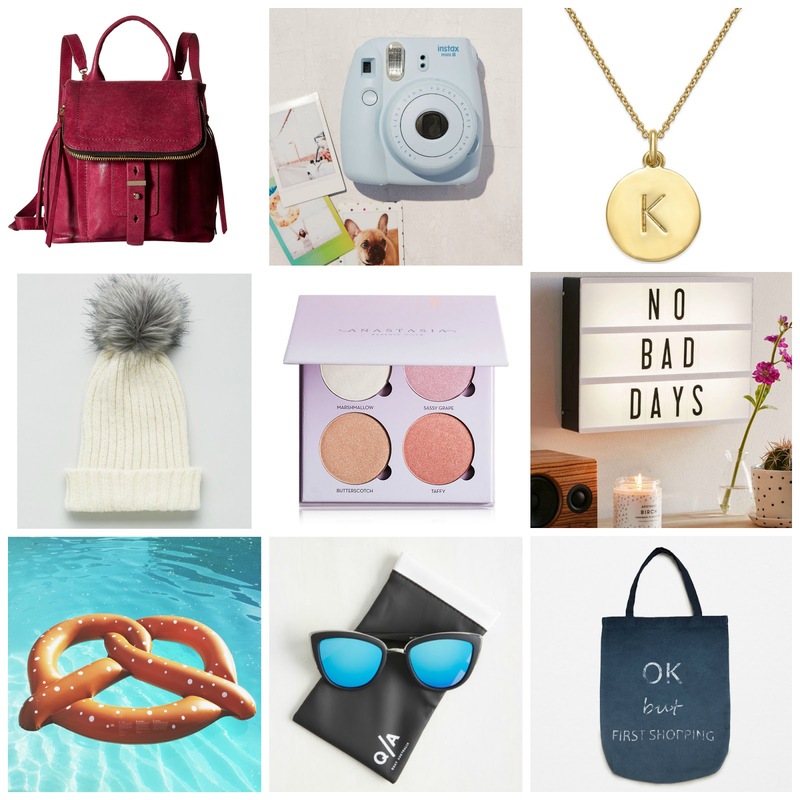 ~Pretzel pool float - Modcloth | 8) If you know what's Quay sunnies and how to pronounce it correctly, you rule the fashion game, babe! ~Blue Lenses My Girl Quay Sunnies - Modcloth | 9) Shopping is your friend's cardio? That deserves a bag with this fun saying on it! ~Fabric text bag - Zara. 1) Candles are such a great gift! Do your grandparents like citrusy, flowery or warm smells? There is a big selection on the market out there! My favorite is anything that smells fresh like a pine tree, especially around Christmas! ~Artist Print Holiday candle - Urban Outfitters | 2) Help your family eat better! Maybe they can switch from fatty food to smoothies thanks to you! It's totally worth the try! ~Kitchen blender - Williams&Sonoma | 3) Granparents are usually the most nostalgic and sentimental members of the family! Surprise them with a very special photobook that you put together just for them, and include all their favorite pictures! ~Personalized photobook - Shutterfly | 4) I got this amazing massage cushion for Christmas last year and every single visit won't move out of our chair since then! Approved by many people, this is a gift with a capital G! ~HoMedic Massage Seat with a heat - Kohl's | 5) If not smoothies, your grandma or grandpa might be a big coffee person! Save their time with this machine! They will love it! 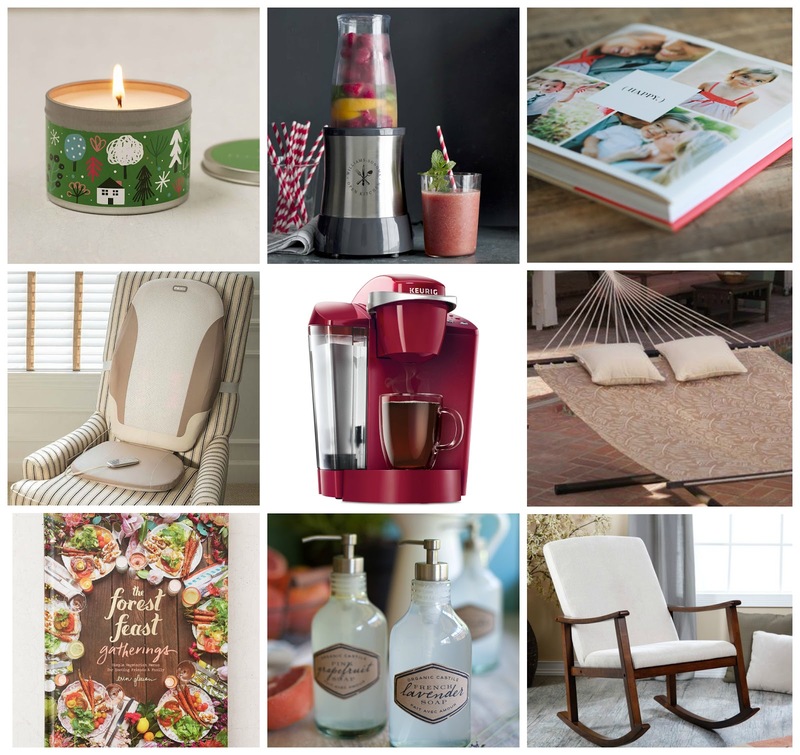 ~Keurig brewing system - Macy's | An outdoor or indoor hammock is truly a gift of the year! Who doesn't want to just grab a magazine and relax in this comfortable thing all afternoon? ~Palm Hammock - Hayneedle | 7) Our granparents usually know every single recipe already! They will definitely find a new motivation for cooking after browsing this book with great food and breathtaking photography in it! ~Forest Feasts Gathering - Urban Outfitters | 8) Are your grandparents already living a healthy lifestyle and they are currently obsessed with everything organic? Please them with a thoughtful gift of an organic soap set! ~Organic hand soap - Lia Griffith | 9) Rocking around the Christmas tree with a new rocking chair! Yas! This amazing chair will receive a lot of gratitude and calm anyone! ~Rocking chair - Hayneedle. 1) I might actually give this xylophone to myself instead of anyone else! LOL I just remembered that this used to be my very favorite toy back in the days! Great for little talented musicians! ~Xylophone - Personal Creations | 2) Furby used to be my biggest wish for Christmas when I was a little girl and I never got it (because it just came out and it was super expensive in my country)! I'd totally love to make some child's day with this funny talking personality one day! ~Furby - Hasbro | 3) On of those toys that anyone will play with, maybe even your parents! Just wind it up and watch it go! ~Dancing robots - Urban Outfitters | 4) I got this unique tearproof watch for myself and I just think that any kid would love the fact that it's not just showing time but also has their favorite character on it! ~Pappwatch - I Like Paper | 5) Again, one of the most favorite things of my childhood - fluorescent stickers that glow in the dark! I used to have them all over my bed! Good times! ~Glow-In-The-Dark stars - Urban Outfitters | 6) Tamagotchi, I still have one somewhere in my parent's attic! That's how much I love this toy! Any little boy or a girl will too! 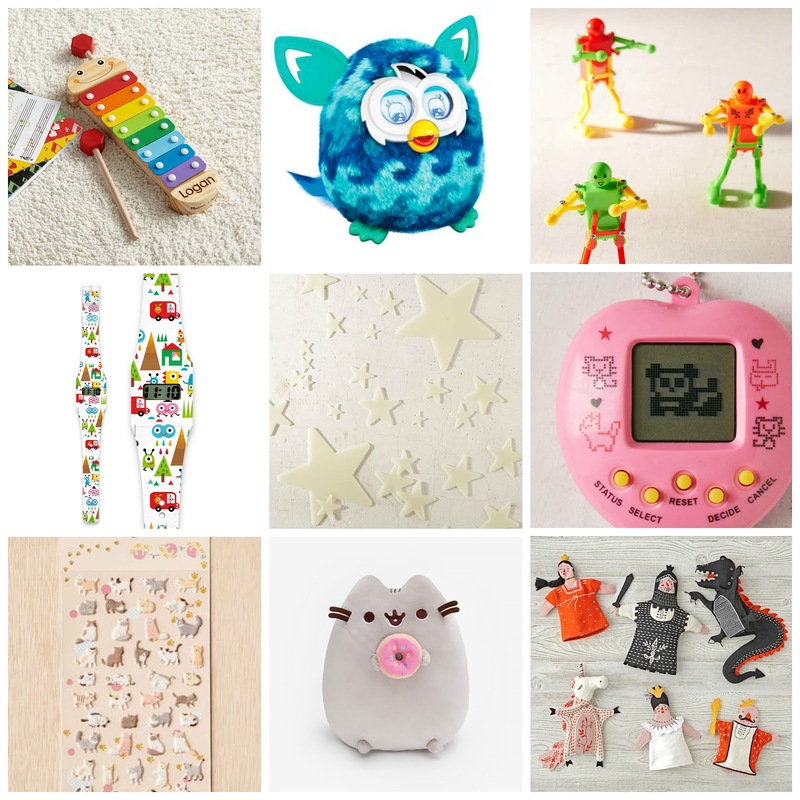 ~Pixapet - Urban Outfitters | 7) I used to collect puffy stickers! I had them all in the stickers album and never ever used them, just looked at them! Ha! These are fun and I kinda wish I was 7 again! ~Puffy stickers - Spring | 8) Pusheen is so cute! Pillow or toy? This thing will do for both! ~Pusheen Donut Plush toy - Jet | 9) If you like giving educative gifts, puppets are the right option for you! But you might also be asked to play a little theatre with them later, whoops! ~Medieval Hand puppets - The Land Of Nod. I think jewelry would be good! Great guide. Hard to believe the holidays are here already.